We know how difficult it can be, outside of Christmas, to get the whole family under one roof. But with AJ Bell Youinvest, you can at least manage your family’s investments in one place – with family linking. Family linking lets one person either view or manage their family members’ accounts. It’s easy, it’s convenient, and it makes the tricky business of managing your family finances feel easier. And if you install our mobile app, you can manage your family's accounts even when you’re out and about. Family linking works by nominating an Account Lead, and giving them ‘view only’ or ‘dealing’ access to each account you want to link. ‘View only’ access means they can see the family member’s investments, ‘dealing’ access means they can also place deals on their behalf. 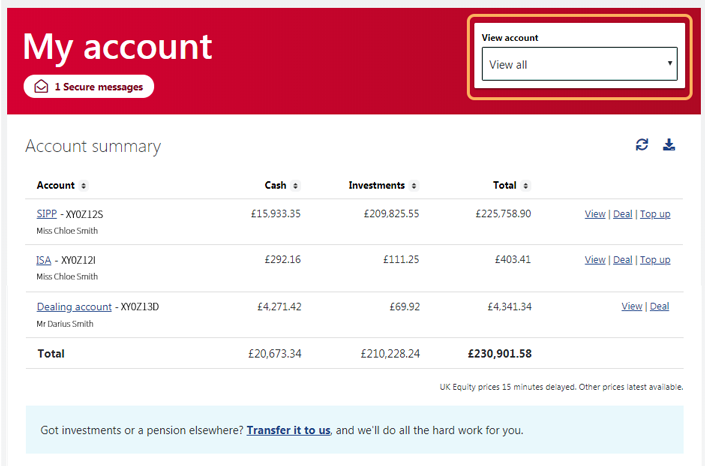 One type of account you can’t include in family linking is Junior ISAs. That's because a Junior ISA can be managed only by the parent or legal guardian (the 'registered contact') who opened the account – who will already have full access to it. To get started, fill in our family linking form. The Account lead will need to fill in and sign the first page. Then each family member will need to sign and confirm whether they want to grant the Account Lead ‘view only’ or ‘dealing’ access. Once we’ve received the form, we’ll let you know when family linking has been set up. When it has, you’ll be able to see the family members’ accounts that are linked to yours. If you, or a family member, are no longer able to manage your own account, you can invoke power of attorney. To do this, please contact us. Important information: You should be aware that if you give a family member or representative dealing access to your account, you are giving them permission to make dealing decisions on your behalf, which may put your capital at risk.